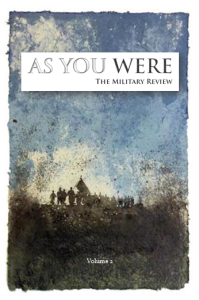 Just a week before the second-ever Military Experience & the Arts Symposium—this one, to be held May 14-17 at Cameron University, Lawton, Okla.—the Kentucky-based non-profit has released a second volume of the rebranded literary journal "As You Were." The 156-page publication is now available FREE as a downloadable PDF here. The publication notably includes a "Once Again to Be a Little Boy," a poem written by Dillion Naslund, 25, and posthumously published at the request of his parents, Lisa and Jeff Naslund of Galva, Iowa. Dillion Naslund died of a self-inflicted gunshot Dec. 10, 2012. He had deployed as an infantry soldier to Iraq in 2007-2008. He had also returned from a 9-month deployment to Eastern Afghanistan's Laghman Province in July 2011. Back home, in addition to being the member of a close family, he was active in the local fire department, and worked a concrete construction job. Dillion was a former member of the Iowa National Guard's 1st Battalion, 168th Infantry Regiment (1-168th Inf.) and 1st Battalion, 133rd Infantry Regiment (1-133rd Inf.). Both are units of Iowa's 2nd Brigade Combat Team (B.C.T. ), 34th Infantry "Red Bull" Division. "Dillion had felt he was alone," his mother Lisa told the Red Bull Rising blog in 2013, "but we quickly found out that he wasn't." In the days and weeks following his December 2012 funeral, she said, more than a handful of other soldiers have independently contacted her family. They told her that Dillion's example had inspired each to seek help in their own struggles. "Dillion's legacy can be to save lives," she says. "He's already saved lives." Through efforts such as Operation Engage America, and the 2013 television documentary "Dillion," the Naslunds have been active in promoting awareness and education regarding veteran suicides. In February 2015, the Naslunds were interviewed by Military Experience & the Arts president David P. Ervin. Read the article here. A webpage for Operation Engage America is here. On June 20, 2015, the group plans activities in Des Moines, Iowa and San Diego, Calif. A Facebook page for the Des Moines event is here.